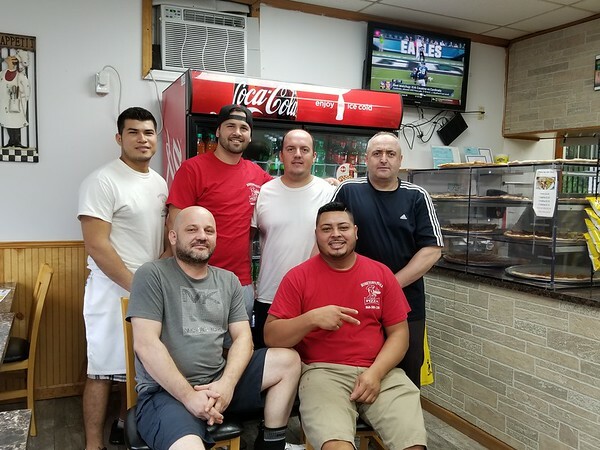 BRISTOL - Hometown Pizza has been serving Bristol quality pizza pies with friendly service for five years. “A lot of people know about us,” said Lucki Pacuku, who co-owns the business with his father. “We’ve been doing it for so long,” Pacuku added, saying the Hometown Pizza name has been around since 1993, when its first location opened in Prospect. Since then, the business has expanded to a number of cities and towns around Connecticut, including Thomaston, Litchfield, Southbury and Wallingford. The Hometown name, Pacuku said, resonates with people when they hear that a new location is opening in their town. “People know the name,” he said. No matter which of the family-run locations a customer visits, they can expect the same great taste. Hometown is known for its thin crust, New York-style pizza. “The buffalo chicken pizza is probably the most popular,” Pacuku said. Everything from the cheese and the sauce to the dough and the toppings is prepared fresh daily. “It’s not frozen or anything,” Pacuku said. He added that, although Hometown is known for its pizza, they also serve a number of other delicious menu items, including grinders, chicken wings, salads, soups, wraps, baked pasta dishes, chicken, veal, seafood, burgers and more. “No matter which one you go to, you’re pretty much getting the same food,” Pacuku. Pacuku estimated that about 80 percent of Hometown’s customers are regulars who keep coming back for the good food. The owners of Hometown Pizza also support the local communities they serve, as they supply all the pizzas that get sold at local sporting events at St. Paul Catholic High School and both Bristol Eastern and Bristol Central High School, Pacuku said. “We give them the pizza for half price because the money they make goes back to the schools,” he said. Hometown Pizza, located at 90 Burlington Ave., is open Monday through Saturday, from 11 a.m. to 10 p.m., and on Sunday from noon to 10 p.m. They can be reached at 860-589-1208. Hometown offers free delivery for orders with a tab of at least $12, within a five-mile radius. Orders from outside this area can expect a small charge for delivery. Posted in The Bristol Press, General Business, on Tuesday, 23 October 2018 21:10. Updated: Tuesday, 23 October 2018 21:12.